Designed by famed Toronto architect Peter Dickinson and completed in 1955, Beth Tzedec is Canada’s largest and best-known synagogue. The foyer, with its spiral central staircase, was inspired by the rebuilt Canterbury Cathedral. It also features an off-white terrazzo floor and a 60-foot-high mosaic wall; on the floor of the Joseph Kerzner Fellowship Hall is another mosaic, its pattern copied from the 1,500-year-old Beth Alpha Synagogue in Northern Israel. Inside Beth Tzedec’s overwhelming main sanctuary, the doors of the ark are framed by slabs of marble and flanked by gold curtains and symbolic bas-reliefs on the north and south panels of the east wall. 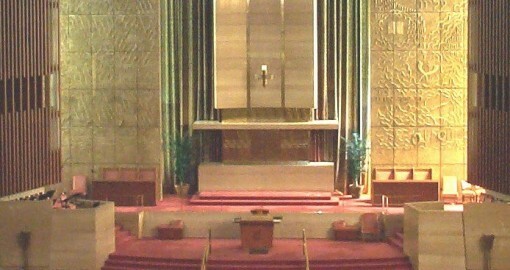 Marble was also used for the Brobdingnagian pulpits on either side of the bimah. 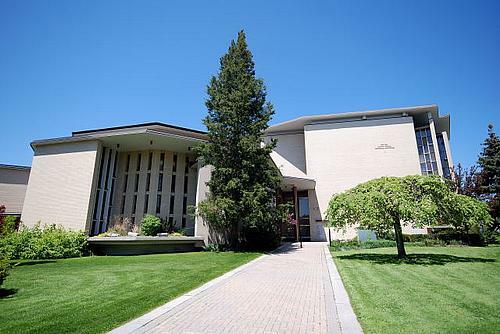 More than 5,000 congregants will attend High Holiday services led by Senior Rabbi J. Benjamin Friedberg, 50ish and low-key, who came to Beth Tzedec a few years after the stormy tenure of Stuart Rosenberg had ended. Friedberg is no barn-burning sermonizer, and the ecclesiastical fireworks are left to the bearded cantor, Paul Kowarsky, whose fine tenor voice outsoars his choir. Beth Tzedec’s membership includes Toronto’s professional and business elite. Small wonder that you will likely see what one congregant-an upscale young lawyer- calls “the annual fall fashion show” if you stop by during the High Holidays.